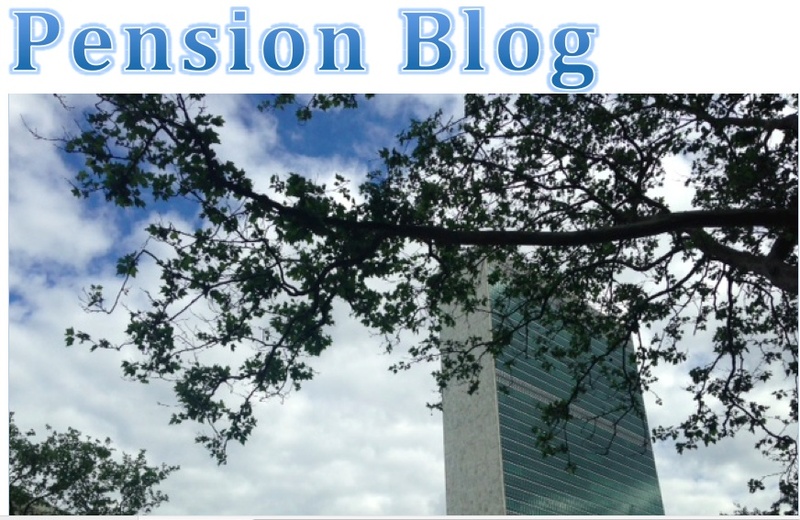 UN Pension Blog: FAFICS President to SG: Uneasy about the RSG. Please correct promptly! FAFICS President to SG: Uneasy about the RSG. Please correct promptly! I write on behalf of member associations of the Federation of Associations of Former International Civil Servants (FAFICS) and some 72,000 retiree members who depend on their United Nations pensions for their income in retirement from the member organizations of the United Nations Joint Staff Pension Fund (UNJSPF). Following the sixty-second session of the UNJSP Board held at Geneva from 20 to 24 July, our Federation wishes to draw to your attention some matters that have emerged from the Board discussions and which are of concern to us. While the Pension Fund is apparently financially healthy at present, some longer-term aspects of the management and governance of the investments of the Fund, as well as the prospective new Financial Rules for the Fund make us uneasy. As regards the investments, we note the Pension Board’s conclusions on the improvements needed with respect to staffing, an up-to-date investment policy, implementation of the asset/liability management recommendations, internal management, information communications technology and communications. Trusting that your Representative will proceed to fulfil the commitments made in these areas, FAFICS will be closely monitoring progress in the coming year. With respect to governance matters, FAFICS wishes to point out that the appointments to the Investment Committee are not being handled in accordance with the Regulations of the Fund. While FAFICS concurs on the proposed names you would submit to the General Assembly, through the ACABQ, we do not agree that the terms be for one year. The terms of reference of the Investment Committee provide in paragraph 21(a) of appendix 3 of the Fund’s Regulations for three-year terms for regular members, with no specified provision for exceptions. The use of single year terms for all members systematically dilutes the authority and leverage of the Investment Committee as a check and balance in the arrangements existing under articles 19 and 20 of the Pension Fund regulations and the corresponding Terms of Reference of the Investment Committee. It further weakens an important Committee already undercut by the resignation this spring of the former chair and the failure to appoint a replacement. This ongoing situation is eroding confidence in the overall arrangements for the governance of the investments. Over the years, the Chair of the Investment Committee has served the Secretary- General and the Pension Board by providing an independent view on the effectiveness and adequacy of the management of investments of the assets of the Fund. The absence of an Investment Committee Chair, the curtailed terms for Investment Committee members and the deficient representation regionally puts at risk the checks and balances of the system. FAFICS urges you to correct this anomalous situation by ensuring that an Investments Committee Chair is named promptly and that three-year terms are proposed to the General Assembly consistent with the UNJSPF regulations. A lack of action on this matter could politicize the membership of the Investment Committee, engendering an unnecessary debate in the Fifth Committee. The RSG has undertaken to relay our concerns to your Office regarding these matters. We trust that a satisfactory solution can be found in a timely manner so that geographic and gender balance can be ensured, while at the same time maintaining the highest standards of competence and integrity. On a separate agenda item the Pension Board reviewed a document from the CEO of the Fund on Draft Financial Rules for the Fund. While the Board will not take action on a new set of Financial Rules for the Fund until its sixty-third session in 2016, FAFICS has insisted that this must be a joint exercise that is coordinated between the UNJSPF Secretariat on the one hand and the Investment Management Division on the other hand. "FAFICS stressed the significance of having all parties agree to the draft Financial Rules and any issues arising from such rules before they are submitted to the Pension Board. It also recalled the bifurcation of the financial activities of the Fund and expected that the rules provide for a single framework in the financial administration of the fund, fully consistent with the Fund’s Regulations. While there were joint administrative activities and reporting, the decision with regard to the investment of the assets of the Fund, as well as for the maintenance of detailed accounts of all investments and other transactions related to the Fund, pursuant to Article 19 of the Fund's regulations, remained the sole responsibility of the UN Secretary- General and his representative.” The CEO of the Fund replied that: "The Board was assured that the process was, and will continue to be, a joint initiative between the IMD and the Fund Secretariat and that all efforts were made, through a collaborative and consultative approach, to ensure that all issues and concerns were solved prior to the submission of the draft Financial Rules to the Pension Board". FAFICS can go along with this as long as it is done effectively and if the RSG is fully engaged in the process following the clear guidance of the Audit Committee in this matter and in a manner fully consistent with articles 19 and 20 of the Fund’s Regulations. To ensure this we believe the Fund’s new financial rules should be jointly promulgated by the CEO of the Fund and the RSG for Investments. This would be consistent with the existing arrangements whereby both officials jointly sign the account statements and both jointly select and supervise the CFO of the Fund. Mr. Secretary-General, on behalf of FAFICS I would like to thank you for your attention. We remain available to discuss the above matters of investment, governance and the new Financial Rules at your convenience and that of your senior advisers. Please be assured of the continuing commitment of FAFICS to assist you in building a stronger United Nations for a better world.